Who else wants to discover a dirt simple way to make massive affiliate sales and drive visitors with credit cards in their hands to your offer? You don't need a list. You don't need a PPC budget. You don't need fancy equipment. If you have not made your first dollar online yet, THIS is the system you need to start building your own online empire. You will kick yourself if you miss out on this (like I almost did...)! You Can Begin To Put This Into Action In The Next 3 Hours. Read About How I Stumbled Onto A Powerful Money-Making Affiliate System, And How YOU Can Do It Too...In The Next Few Hours! My name is Patrick Taylor and I'm going to share with you a way to make money online that actually WORKS! I know you're probably jaded by all of the hype you have heard over the years. If you're like 99% of people who would like to make some extra money online, you've probably purchased dozens of online systems that promise to make you wealthy overnight with minimal work and investment. In most cases, the product creator is giving away 100% of the front end product to the affiliate in commissions!!! Which means, that the person who created the $7 info product isn't making a single penny on the front end....(They could sell 2,000 units in a week and not make anything on the front end) which means that the only way they make money is by getting you to purchase the UPSELL...which leads to enhanced versions of the front end product, and even to coaching programs in the thousands of dollars on the BACK END. My system has NONE of that. The GOOD news is that if you're reading this e-mail from your home desktop or laptop computer, you probably already have EVERYTHING YOU NEED to start making money online in the next three hours. To tell you the truth, when you get my e-book you're probably going to be let down for a moment. It's not a really long book, and it's not terribly intricate or complex. It's the stuff that DOESN'T WORK that's filled with complex formulas, ninja tactics, and fancy graphics and banners. You're going to be incredulous. You're going to feel that it's just too simple to really be effective. But I'm going to tell you something...if it was really complex I wouldn't be able to do it!!! Most people who are having great success with their systems are not revealing all the details...at least not while it's working for them. They might give you one piece here and there, but it's up to you to take all the pieces of the jigsaw puzzle and put everything together...which is what I'm doing for you here. I'll tell you EVERYTHING about my sytem in the e-book. As an an affiliate, you promote products that someone else has created. You agree with the product creator for a percentage of the selling price. You get affiliate links either directly from the seller or through a network like Clickbank or JVZoo. When a sale is made through your link, you get a commission. Historically, the problem in promoting any offer is getting enough TRAFFIC through your offer to make any real money. My System Solves That Problem For You! You don't need a product! You don't spend money on PPC (pay-per-click) campaigns! If you have your own home computer system, most likely you already have everything you need to begin making money as soon as you read my super simple e-book! HOWEVER...It's a big pond. There are more affiliate offers out there than anyone can possibly promote by themselves. I could never possibly promote every affiliate offer that comes out on the Internet. And, frankly, if I don't let you in the club someone else probably will (and probably for MUCH MORE MONEY than I'm charging). So, I figured why not share my secret? I'll make money, and you can stop spinning your wheels trying every useless front end product under the sun. How many systems have you purchased in the last year that promised to make you rich? When you add them all up, I bet they cost TWICE what I'm asking for a SYSTEM THAT ACTUALLY WORKS! In fact, I'm so ABSOLUTELY CERTAIN that this is going to work for you that I AM TAKING ALL OF THE RISK! Put it into action and watch the results. If you are not 100% happy with the outcome anytime within 30 days, I will refund your money. That's how confident I am in my product. Personally, I think in 30 days you'll be writing me a letter to THANK ME for helping you to turn your financial situation around! I'm offering several bonuses which you can read about in the text on the sales page. 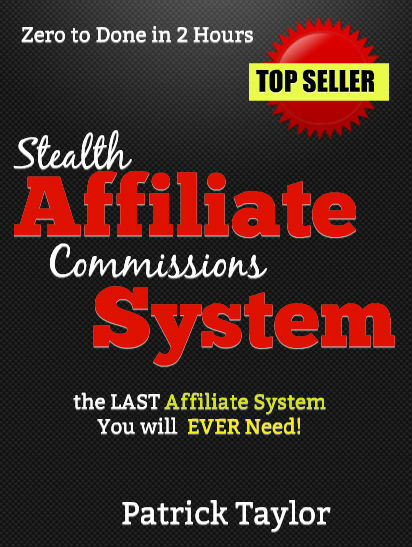 IN FACT, ONE BONUS ALL BY ITSELF IS WORTH THE ENTIRE PRICE OF THE "STEALTH AFFILIATE COMMISSION SYSTEM!!!" This is just SUCH a no-brainer. Don't wait too long because I'm limiting this offer to the first 300 people who buy. I don't want to saturate the market with this system. If you're viewing this message, you're fortunate and still have time to get in on the ground floor. I invite you to simply click the link below to start building a real, honest-to-goodness Internet business that you can begin building as soon as today, and scale as big as your imagination can take you. P.S. I know this price is a bit more than the usual $7.95 you're used to paying for the average front end product. Remember, there are no up sells. I'm not just trying to entice you into my sales funnel in order to sell you five more products totaling over $200! This is IT. This is the entire product, plus a host of valuable bonuses. P.P.S. Okay. You're on the fence. I understand. I've been there. You want to make money online, but everything you've purchased before seems to have left out one important element. The Stealth Affiliate Commissions System is inclusive. It provides you with a simple, effective way to finally put all the pieces of the puzzle together and actually get your first check. The reason for the increased price is to drive off all of the tire kickers. I only want people who are absolutely serious about building a real business. Although simple, it's a powerful system that actually WORKS. I don't want to dilute the effectiveness of this method by spreading it around willy nilly for under $10. P.P.P.S. Last thing. What is your plan B? Do you have an alternative? Look, you can be doing exactly the same thing in 30 days from today. I'm offering you a way to finally quit the rat race, fire your boss, and develop a business that you can work from anywhere in the world! This is the exact system I have used successfully. And when I button up this product and send out a message to my list, I'm going back to my home office and use the exact methods I'm sharing with you to earn some additional quick money! You have nothing to lose and everything to gain. I'm taking all the risk out of the equation. Use the system and get results. "Zero To Traffic In 48 Hours"
This is a complete overview of affiliate marketing, explaining in depth with detailed graphics the entire process of affiliate marketing and the associated concepts. From getting set up with an affiliate network, payment structures, driving traffic, and crafting persuasive marketing material. When you have completed reading this book you will be an AFFILIATE AUTHORITY! "How To Launch A Digital Product Business!" Take your initial training to the next level! This is the next logical progression in your training. Once you have mastered affiliate marketing, promoting others' products, you can take your business to the next level and create your OWN digital products and let other affiliates sell YOUR products. Create an entire sales force working to market your products 24/7 while you sleep! Create your own digital product empire!! !